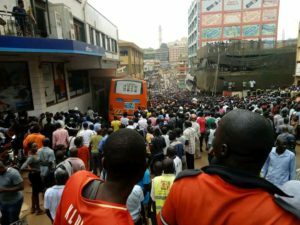 One person has so far been confirmed dead and several injured when a Kakise Bus lost control, ramming into a building at the Ben Kiwanuka-Kyaggwe Road Junction in Kampala. The dead and injured are vendors that were found on the pavement of the building this afternoon. Police is still struggling to remove the bus and the dead. More details to follow.